Exclusive Logo Ties - Scarves - Mugs - T-shirts - Polo Shirts - Sweatshirts - Sweaters - Baseball Caps - Badges and much more ! 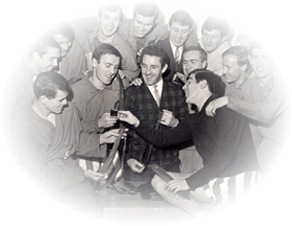 Dave Mackay Club Ties was established over 40 years ago by Mr. Dave Mackay, the great Tottenham Hotspur 'Hardman' of English football and my father. 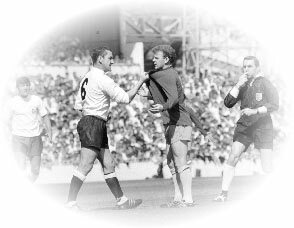 (That's him adjusting Billy Bremner's tie in the photograph on the left ! and showing off our merchandise to some familiar faces, on the right.). We specialise in the design and manufacture of club and company logo ties, scarves and other corporate clothing. Our promotional and corporate merchandise covers a whole range of items from cufflinks to umbrellas. Whatever the size of your company or club, or quantity requirement, we will devote the same experience and individual attention needed to create your own specific identity. Click through our pages for examples of our merchandise, of which,we guarantee to deliver the best products at the lowest prices.